Eugene F. Weigel authored the special report on beer for the World’s Columbian Exposition in Chicago in 1893. It was published finally in 1901 with the other special reports. Weigel was a member of the five-person committee formed to judge the beer category of the agricultural exhibits. A reader non-au fait with the background would find it odd he gave no data along the lines found in the special reports for whisky and wine summarizing the awards given, names of winners, details of the judging, etc. He barely refers to the Exposition at all except to note some of the non-American and in particular southern hemisphere beer contributions. He noted that South America sent 50 items to be judged and that beers had been exhibited from Japan, Italy, and Australia. Almost all the essay is a short history of brewing and the brewing industry, useful as far as it goes. He focuses on contemporary production methods especially large scale use of refrigeration machines which made brewing a year-round affair and assisted production in warm countries. In regard to the brewing committee of which he formed part, he says nothing and does not even mention the names of the other judges. There was a good reason for Weigel’s silence. The judging of beer had been a debacle in the fair, one of its few failures as in general the Exposition was a glittering success. But even by 1901 it was deemed important to sidestep the sorry episode of whether Pabst or Anheuser-Busch was top brewing dog back in ’93. Unfortunate, but understandable. Who was E.F. Weigel? Little is available on him, he was a Union Army veteran and held senior positions in the GAR (Grand Army of the Republic). Most of his career was spent in public administration in the state of Missouri and he held two terms as its secretary of state. Later, it appears he worked for the City of St. Louis where no doubt he had known some of its brewery chieftans. One of the brewing innovations he is dubious of is the use of cereal adjuncts. 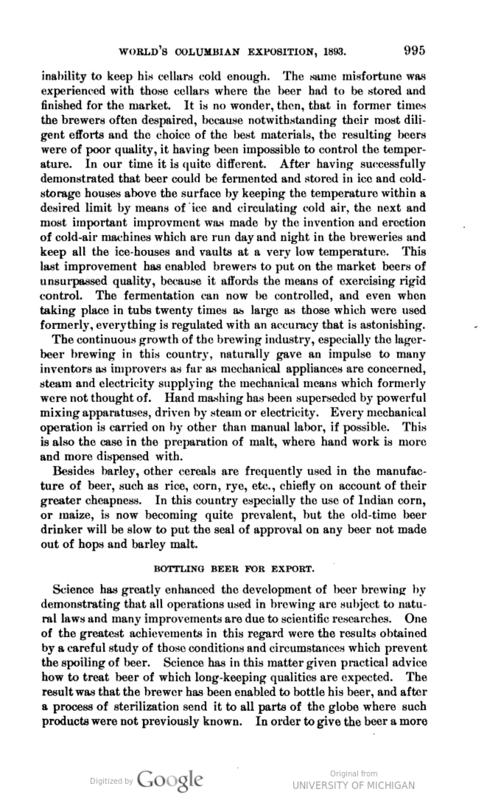 I include below an extract from the report (via HathiTrust and subject to my usual acknowledgment in that regard) in which he makes his preference for all-malt beer quite clear. In the matter of pasteurization, he seems to accept it without reservation as a necessary means to ensure the expansion of the industry. But as someone who had tasted probably a few hundred beers for his judging duties, it is notable that he held out for all-malt, even in a period when corn and rice had become an article of faith for U.S. brewers and their scientific backers. He makes clear that large brewers had evolved a consistent, “refined” beverage. One might be tempted to think American beer had become the very light, fizzy refresher which typified North American beer on the eve of the craft revolution. But everything is relative. Publications by Pabst during or proximate to the Exposition show it was brewing 1.3 million barrels per annum and made annual purchases of almost 2,000,000 lbs of hops. That averages 1.5 lbs per barrel. By way of comparison, that is rather more than Sam Adams lager uses (1 lb per barrel). Even if Pabst’s main brand, what became Blue Ribbon, used 1 lb hops in 1901, that was a very hoppy beer by today’s standards especially for lager. This Canadian government study of the same period shows that for a number of Pabst beers available in Canada, their starting gravities were just over 12 P (probably 12 was the target but perhaps it varied with different brands). Final gravities, see other parts of the report, were between 1011 and 1016. This means ABV between 4 and 5%. Attenuations would be 65-75%. Today, American Lager, see the 2015 BJCP, places the FG range at 1004-1010, with alcohol of 4.2-5.3% abv. Attenuations today for lager start, not end, at 75%. (Ironically, it includes PBR as an example). Irrespective of adjunct use then and now, it is obvious the c.1900 beers had more character than today. When milk pasteurization and industrial food processing were in their infancy, a refined taste in beer was something quite different to today. It meant a taste free from yeast infection, sourness, an old or cheap hop taste, or other artisan-scale problems. These had been eliminated by modern science, and money. Refined didn’t mean bland.